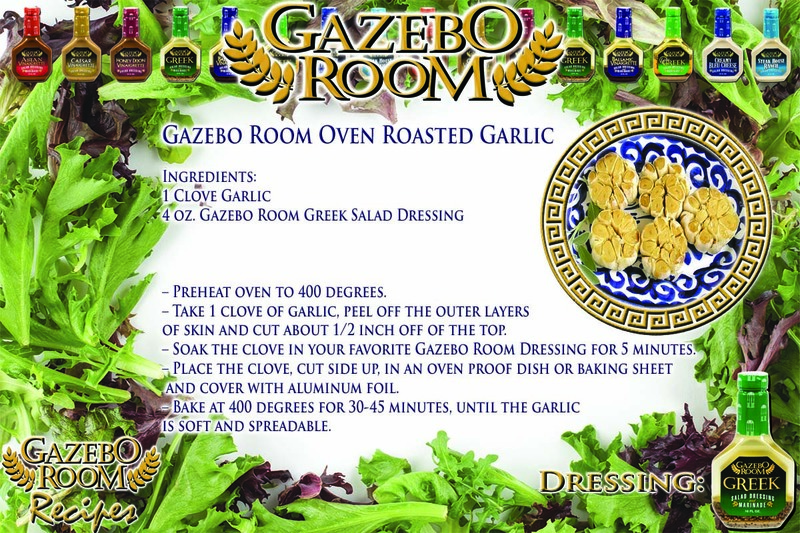 Here’s another quick and easy Gazebo Room recipe that’s perfect for grilling season! Just take 2 romaine hearts, chop them in half lengthwise, brush generously with Gazebo Room Greek or Lite Greek Salad Dressing and sprinkle with parmesan cheese. Toss them on the grill for a few minutes alongside your favorite Gazebo Room marinated meat and you’ve got a smoky, flavorful salad that matches your meal perfectly! If you would like to hear more recipes, you can ask about different Gazebo Room Dressing flavors, courses, or ingredients, like chicken, pasta, Seafood, vegetarian and more, or say exit to leave the skill. 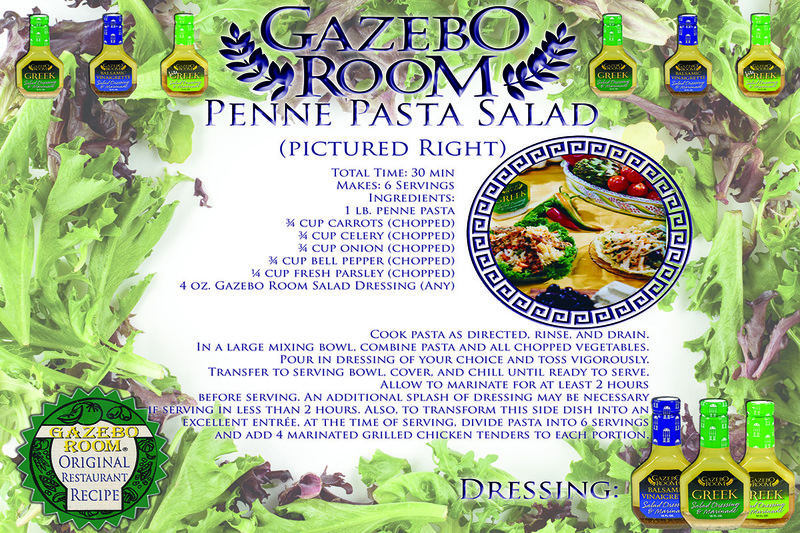 This Classic Greek Salad Recipe is considered one of the best ways to showcase the great taste of Gazebo Room Original Greek Salad Dressing. Preparation: Place salad greens in a large mixing bowl. Add tomato wedges, onion slices, crumbled feta, olives, and peppers. Pour in dressing and toss vigorously. Divide contents of bowl evenly over 6 salad plates. Top off salads with anchovies. 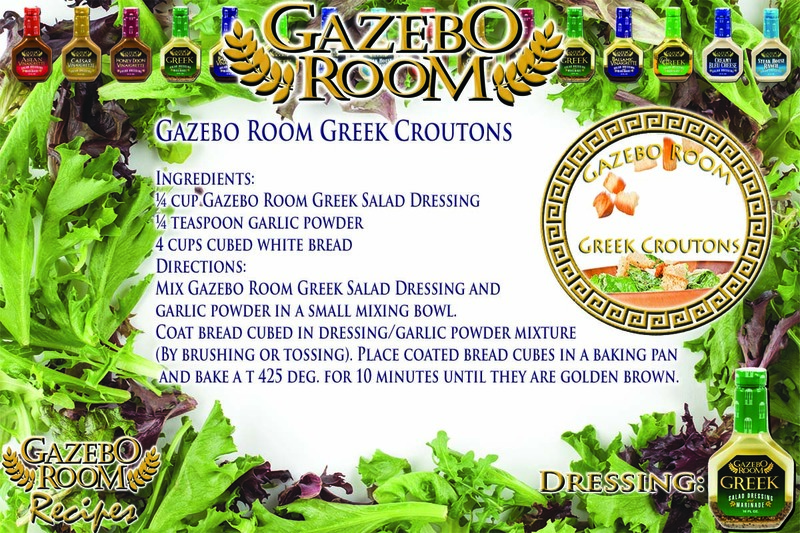 Gazebo Room Homemade Greek Croutons are a great way to add a little more Greek flavor to your favorite salad, and they are healthier and less expensive than many store bought croutons! Mix Gazebo Room Greek Salad Dressing and garlic powder in a small mixing bowl. Place coated bread cubes in a baking pan and bake a t 425 deg. for 10 minutes until they are golden brown. Keep in an airtight container until you are ready to use them on your favorite salad. 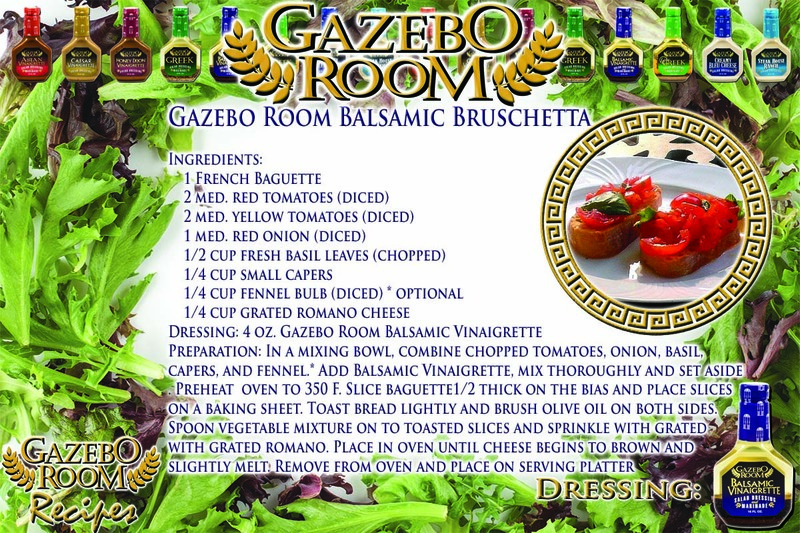 Note: You can also use Gazebo Room Balsamic Vinaigrette in place of Greek for delicious croutons that are extremely low in sodium. This Gazebo Room Bruschetta appetizer recipe adds a Greek twist to your Italian dinner…Just make sure that your guests don’t fill up on bread. Preparation: In a mixing bowl, combine chopped tomatoes, onion, basil, capers, and fennel. * Add Balsamic Vinaigrette, mix thoroughly and set aside. Preheat oven to 350 F. Slice baguette1/2 thick on the bias and place slices on a baking sheet. Toast bread lightly and brush olive oil on both sides. Spoon vegetable mixture on to toasted slices and sprinkle with grated with grated romano. Place in oven until cheese begins to brown and slightly melt. Remove from oven and place on serving platter. Here’s another healthy appetizer recipe that’s a quick and easy crowd-pleaser. It also makes a great snack if you’ve got leftover veggies or pizza ingredients to use up! 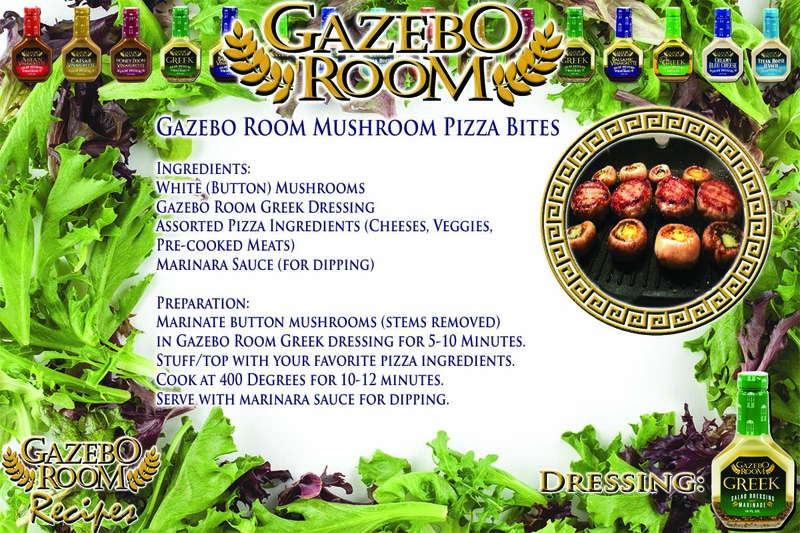 Marinate button mushrooms (stems removed) in Gazebo Room Greek dressing for 5-10 Minutes. Stuff/top with your favorite pizza ingredients. Cook at 400 Degrees for 10-12 minutes. This simple recipe is perfect for those hot and humid summer days when you need a cool, refreshing snack to bring with you to the pool or the beach. First, slice your cucumber in half lengthwise, then hollow out the center of each half, removing the seeds and allowing plenty of room for additional ingredients. Next, combine chopped olives, feta, dill, sunflower seeds and Gazebo Room Dressing in a mixing bowl. Cook pasta according to directions. I used the 3-minute cook San Giorgia Quick Cook Penne Rigate. Combine all ingredients in large bowl with lid. Stir, shake, eat and enjoy! A lighter version of our pasta salad, all you need is pasta, parsley and veggies to really let the Gazebo Room flavor shine through. For a special treat, separate into three portions and make one Greek, one Balsamic Vinaigrette and one Lite Greek! Cook pasta as directed, rinse, and drain. In a large mixing bowl, combine pasta and all chopped vegetables. Pour in dressing of your choice and toss vigorously. Transfer to serving bowl, cover, and chill until ready to serve. Allow to marinate for at least 2 hours before serving. An additional splash of dressing may be necessary if serving in less than 2 hours. Also, to transform this side dish into an excellent entrée, at the time of serving, divide pasta into 6 servings and add 4 marinated grilled chicken tenders to each portion. 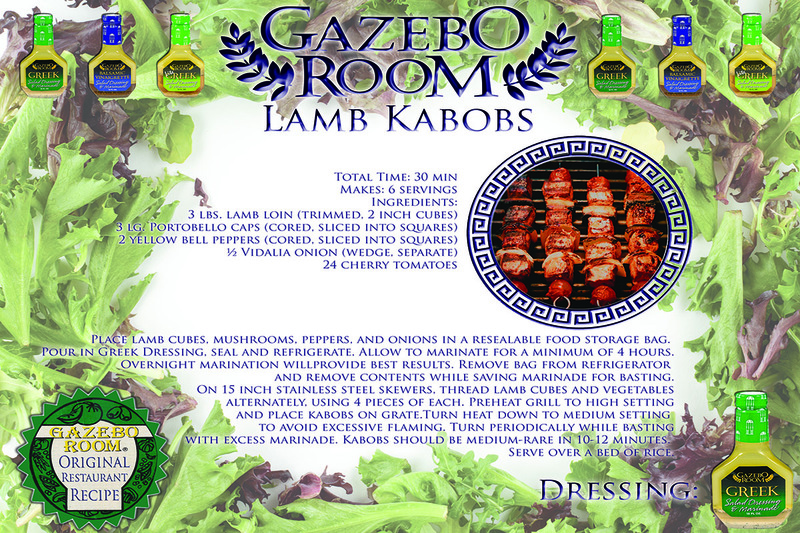 This is our favorite way to showcase the versatility of Gazebo Room as a marinade. 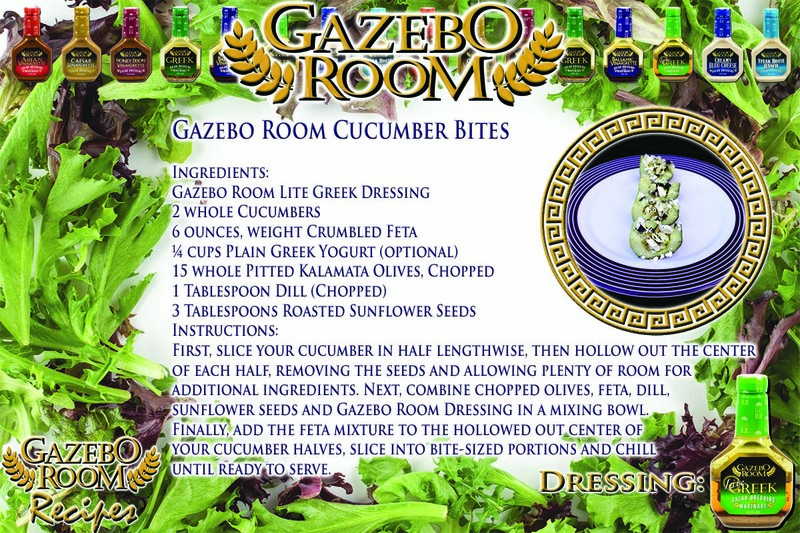 From the savory lamb, to the tangy bell peppers, let your guests experience all of the ways that Gazebo Room brings out the best flavors in their food. Place lamb cubes, mushrooms, peppers, and onions in a resealable food storage bag. Pour in Greek Dressing, seal and refrigerate. Allow to marinate for a minimum of 4 hours. Overnight marination will provide best results. Remove bag from refrigerator and remove contents while saving marinade for basting. On 15 inch stainless steel skewers, thread lamb cubes and vegetables alternately, using 4 pieces of each. Preheat grill to high setting and place kabobs on grate. Turn heat down to medium setting to avoid excessive flaming. Turn periodically while basting with excess marinade. Kabobs should be medium-rare in 10-12 minutes. Serve over a bed of rice. If 15 steel skewers are not available, pre soak 10-12 inch bamboo skewers for a minimum of 30 minutes before assembling kabobs. When using shorter skewers, reduce portions to 3 pieces of lamb and vegetables per kabob. This will yield an additional 2 kabobs (8 servings). 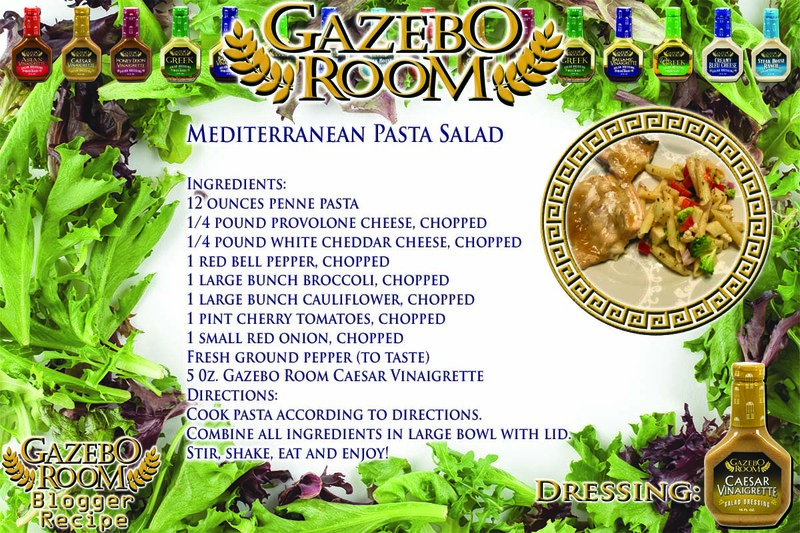 If you would like to hear more recipes, you can ask about different Gazebo Room Dressing flavors, courses, or ingredients, like chicken, pasta, Seafood, vegetarian and more, or say exit to leave the skill.